1Zoology Department. Faculty of Science. Zagazig I'lmershv. Benha Branch. 2National Institute of Oceanography and fisheries. Can*o. Egpi. Daring spring. 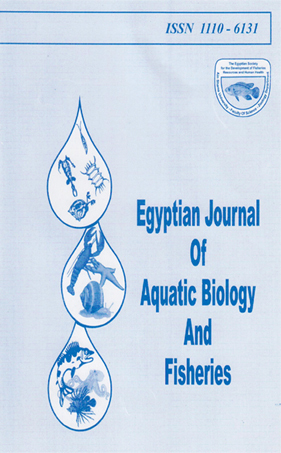 2004. samples of Tilapia zillii, Clarias gar&pinus and Mugil cephalus were collected from Nile water at El- Kanater region in order to study the effect of heavy metals (Fe. Mm Zn . Cu .Pb and Cd) accumulation on the enzyme (GOT & GPT) activity as well as livers tissues of the three fish species. The results showed that Fe. Mn. Zm Cu. Pb and Cd accumulation in the livers of the above three fish species ranged between 802.626 -1021.97. 9.731 - 26.061 and 123,656- 166.364.34.144-116.364. 27.957 - 89.394 . 16.061 -42.742 ug/g dry wt respectively. The main observed lesions were (1) dilation and congestion in blood vessel and blood sinusoids (2) hemorrhages in hepatocytes (3) hemolysis and hemosidrine pigment (4) degeneration and necrosis in hepatocytes (5) fatty degeneration in hepaocytes (6) parasite cysts in liver tissues of Tilapia zillii. Increase in GOT and GPT activities was associated with liver cells damaae. These changes in enzvmes activity and lesions in liver were recorded by the following order: Tilapia zillii > Clarias gariep'mus Mugil cephulus.